The swearing in chart of any government is very important to know not only what is happening during its 5 year term but also no its return to power. The Modi government took oath and came to power on 26th may 2014 no at 6.11 PM, New Delhi. 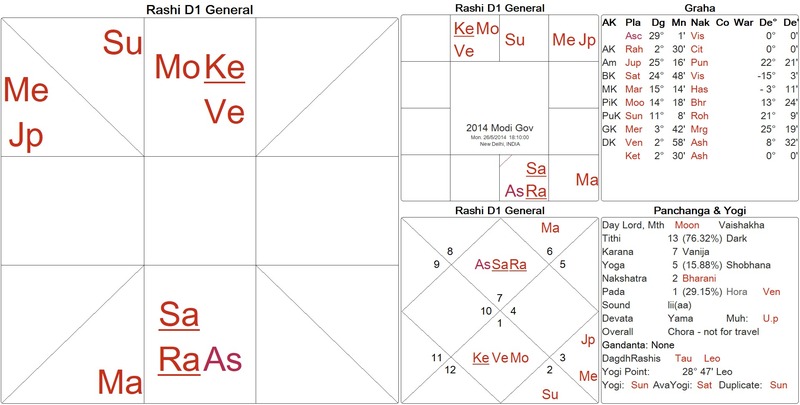 Tulā Lagna with both 5th lords (power) Rahu and Saturn (exalted, retro) in it shows centralization of power but the retro Saturn shows that this will be like a sadhu, a Chanakya wielding the whip to keep the country together. We have seen all that. But what is interesting is the last Ketu dasha from 18 Jan – 3 May 2019. Ketu is the 2nd lord in 7th bhāva forming a Śrīmanta Yoga. In addition it conjoins Venus and Moon – two yogas (a) Annapurna yoga promising great fortune and wealth for India plus tremendous popularity and (b) Rudra Yoga which causes battles if rudhira (blood) is spilt. Pulwama Terrorist Attack (Ketu daśā Sun antara: 14 Feb 2019, a convoy of security vehicles on Jammu Srinagar Highway was attacked by a vehicle-borne suicide bomber at Lethpora in the Pulwama district, Jammu and Kashmir. 40 Central Reserve Police Force (CRPF) personnel were killed as well as the attacker. The responsibility for the attack was claimed by the Pakistan-based Islamist militant group Jaish-e-Mohammed. IAF Balakot Strike (Ketu daśā Mars antara): 26 Feb 2019, 3.30am (Gregorian Tuesday, Vedic Monday night – day changes at sunrise). 12 Mirage 2000 fighter jets of the Indian Air Force crossed the Line of Control and dropped one-ton Israeli-make smart-bombs on a vast terror training facility at Balakot, which was the hub of suicide attack training. Some 300 terrorists, trainers and Jaish commanders planning more terror strikes in India were killed. Mars in 12th bhāva spells doom for his enemies and complete break-down of relationship. This is māñgalika doṣa in regular nativities as the reaction is tremendous and soft approaches will not work. Elections are to be held between April 11 to May 19, 2019. The counting of the votes has been scheduled for May 23. A major part of the elections are in Ketu daśā Saturn antara and later in Mercury antara till 3 May, 2019. Narendrabhai Modi will have many surprise wins. The latter part of the elections are in Venus daśā Venus antara and so is the results. As lagneśa in 7th bhāva, Venus promises a return to power.